Can a team have too much talent ??? Has the “1-&-Done” attitude backfired on Coach K ??? Maybe … When Giles, Tatum, & Bolden were sidelined (still questionably) I saw 3 kids who were not always engaged in the game … not you normal Duke player !!! This is what led people to wonder why they sat for so long. Could injuries have been just an excuse for the possibility that they were not cutting it in the classroom ??? Remember, in the real world, it’s not what it is, it’s what you call it !!! Then there were the rumours that they all believed they’d be drafted with little or no play … It was reminiscent of the whole Kyrie Irving debacle where the team that had reformulated their chemistry when he went down, after only a handful of games, to become winners. Then he forced himself into the Big Dance games and the team suffered, just so he’d improve his Draft Stock. Should Harry Giles be Red-Shirted ??? What in the world is wrong with Grayson Allen ??? I haven’t a clue … I hope the powers-that-be get him some psychological help as I wonder if he “learned” that antic during his younger playground days. Let’s face it, Grayson is an uber over-achiever for his size, so such a playground antic might have been something from yesteryear that is rearing it’s ugly head. Let’s think of it this way … What if Duke were to make it to the Final Four and he were thrown out of a game and the next game for tripping an opponent ??? With so much talent, will Coach K be forced to play deeper than his usual 6-7-8 guys ??? Dear Lord, since we know that Coach K is a man of deep and abiding faith, and that includes prayer, couldn’t you find a way to impress on him that he has too much talent not to play them all ??? 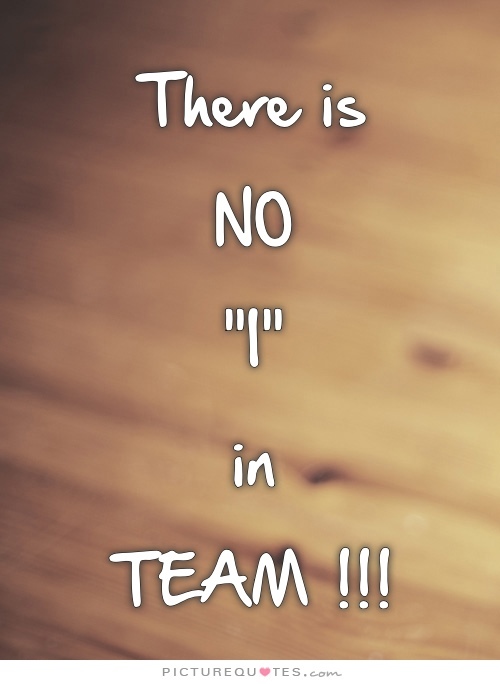 It’s worked for many, many other winning coaches, I count at least 9, or more, who could contribute !!! Who will be pivotal players this year ??? Luke has come back to Duke a more mature player. He can shoot and score much more consistently from all over the Court. He Rebounds and plays much better Defense. I noticed that at least one national CBB reporter has picked him as having the potential to be ACC Player of the Year, and I agree !!! I like what I have seen of Frank Jackson. He is a very insightful player and can lead this team aptly … I also like what I’ve seen of young Mr. Tatum in the short time since his return. He reminds me of a Magic Johnson type. Often disregarded in the overall fray is Matt Jones, whom I like to call “Cazzie” because he reminds me of Cazzie Russell of the glory days of the 70’s Knicks. Matt is a 4 year Senior who is a defensive stalwart and well-seasoned clutch shooter. He also shares over 400 “Ironman” minutes with Luke and Amile. Who has not lived up to their Press clippings??? I’ve been wondering why Marques Bolden has not returned to the form I was so impressed with early on … I loved that he played so toughly under the basket, boxing out, angling for rebounding position, protecting the Baseline, and playing smart defense. He was surely on his way to doing things that past Duke “bigs” did not or could not. I only hope he can return to that style of play … Duke needs it !!! That’s because Chase Jeter continues to disappoint. In 13 game appearances, 190 minutes thus far, he has blocked 13 Shots, grabbed 26 Rebounds and scored 40 Points, but he has been responsible for 14 Turnovers and 25 Personal Fouls. I think I’d rather see others get more floor time since he is essentially a net zero !!! Who are the unsung heroes of his year’s team ??? 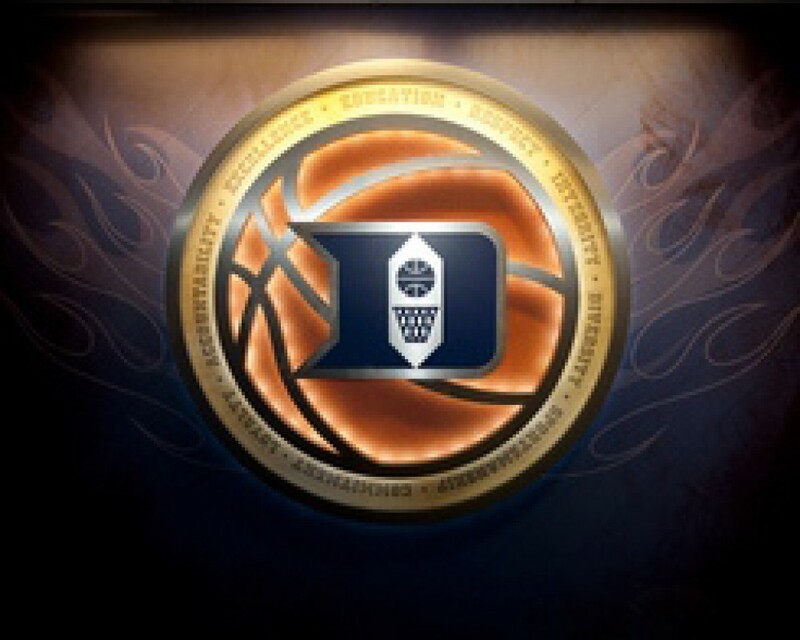 Is getting a Duke education enough for the guys who were recruited, but never given a chance to play ??? Last season I asked why Sean Obi wasn’t playing and we found out that in the off-season, he had knee surgery by people outside of the Duke Orthopaedics Department. As someone who knows how a life can be altered by such procedures, I must wonder if he is applying himself in class. To answer the question, I must guess that a free Duke education might be worth not playing as much as one might wish … I just hope they have good Majors and get good Grades !!! What must “The Admiral” be thinking as he attends yet more games while his son pulls splinters ??? I have tonnes and tonnes of admiration for “The Admiral” but I must wonder what it must be like to see his son make the sacrifice after sacrifice and not be given any opportunity to prove himself. It has to be daunting for Justin, especially living in the shadow of his Dad, who was one of the all time greats. Duke could and should be the pre-conference season favourite to win the ACC, but they might be the most discombobulated bunch in the conference. Long time Duke fans expect to see a surely formulated set of starters and those 6-7-8 players. When one considers the “problem” with Grayson, we have to wonder who will step up only to be bounced back to the Bench once he returns, and his return is, as our British friends say, a “dead cert” !!! In my opinion, I do not like that Duke is still unsettled. Frenetic is not the way Coach K plays, nor does he normally use his whole team. Somewhere we all expect some semblance of order … and that is still a question mark. Right now, Amile, Luke, Matt, and Grayson are the 4 cornerstones of the team, but there is too much potential in the balance of the team. So who “sits” to allow that potential to play ??? I do not think this is a situation Coach K has ever encountered at Duke, but he certainly has with the Olympic Teams he has coached. So, I’m happy to lean heavily on his wisdom, experience, and creativity. I’m more concerned with seeing this team compete for Coach K’s next National Championship than I am seeing who gets into the NBA. As Coach K’s Freshmen-laden roster prepares for their first exhibition game on Friday night against Florida Southern, we’d like to introduce you to Duke’s Frosh for this season. We’ll do it by the numbers … jersey numbers, that is. 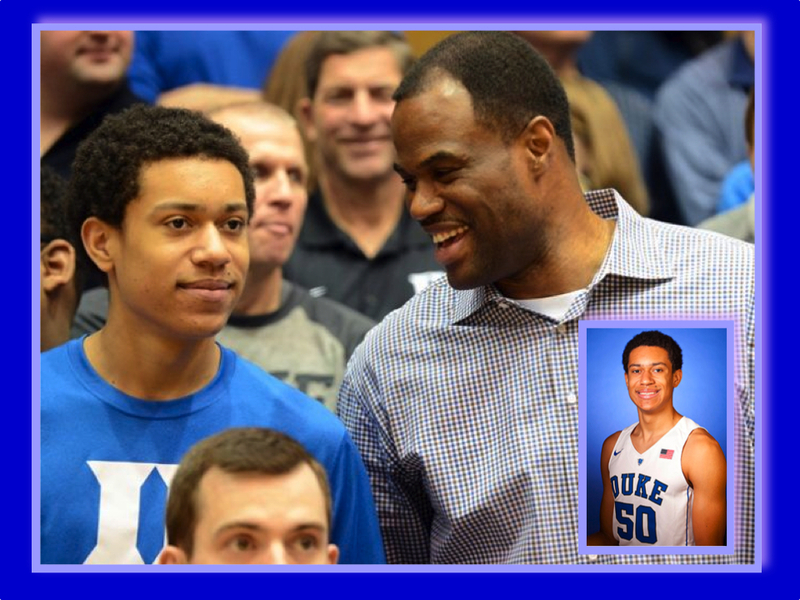 The youngest son of David Robinson, Justin, was originally meant to be a preferred Walk-on at Duke, but Coach K awarded him a scholarship once he arrived on campus. Where does Duke need him ??? There was speculation that with his father being a late bloomer – The Admiral was a 6’7” Freshman – maybe Justin could be as well, and spring up to 6’10” … Not quiet the seven footer his father is, but that could improve his game a lot. No one ever complains that someone is too tall in basketball. The thing is, the younger Robison is already 19, so we can’t bank on that at this point. What we can hope is that he improves his weight, which is currently 190 pounds, so that he can be a stronger Power Forward and work on his game for the future. Who does he remind us of ??? Best Case Scenario: Lance Thomas and Thomas Hill have all been lithe Forwards that have competed very hard for championship teams at Duke. Worst Case Scenario: Todd Zafirovski, a Walk-on that moved to a scholarship player though he never saw the court during competitive periods. Robinson has a fight on his hands to get on the court at Duke this season and next, considering the type of recruits the Blue Devils are currently targeting. 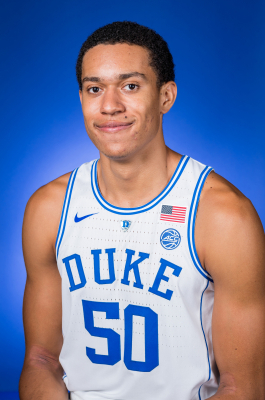 He is a very astute student who cited Duke’s academics as one of the reasons for his enrollment, so we suspect he may not be too broken up about his future playing time. Watch for our next Frosh introduction right behind this guy.